Modern people look for videos and animations for their learning, and these are often not from reputable sources and raise more questions than they answer. An example is an animation of a half wave dipole on the Internet, and being discussed on QRZ. 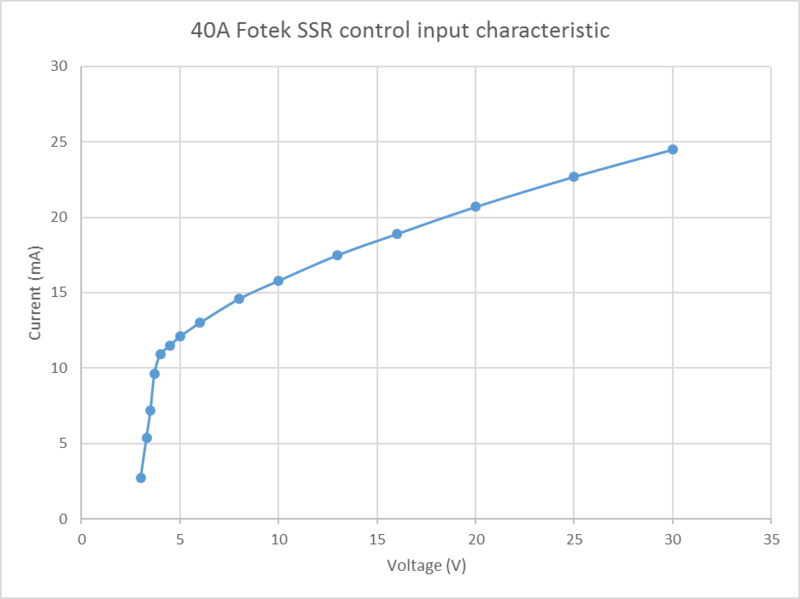 Power Amplifier Run On Timer (PAROT) (Duffy 2013) reported some measurements of the voltage withstand of Veroboard. Voltage withstand between tracks was observed to be just over 1400Vpk. 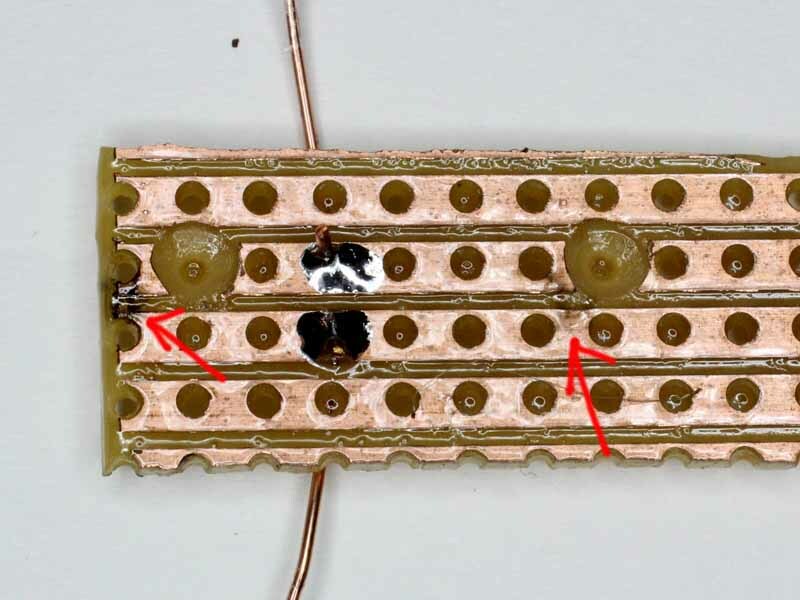 This article reports some further measurements of genuine Vero strip board. 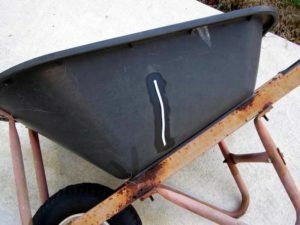 We bought a cheap wheelbarrow 6 years ago, and it is like grandfather’s axe: 6 new handles and 3 new heads and its 100 years old. This thing has had numerous tyre patches (some due to defects in the cheap Chines tubes), three new tubes, two new tyres, it is trying to rust out, and the concreters working here last Winter used it to carry fully loads of concrete… splitting the side of the poly tray. The split has been growing slowly with temperature cycling, I should have drilled some small holes to defuse the stress raiser at the ends of the split. Whilst I have replaced the barrow, we continue to use this one to exhaustion… and I succumbed and plastic welded the split in the tub. A similar bead on the inside dressed with a burr to remove edged that would catch on tools compete the job… we will se how long it lasts. This article documents design of a capacitive transformerless power supply for operating low voltage, low power logic from power mains. The intended application is PAROT (Duffy 2013), though it has potentially wider application. (Microchip 2004) gives a method for design of a capacitive transformerless power supply for operating low voltage, low power logic from power mains. The equations seem simplistic for a circuit whose apparent simplicity belies the complexity of an optimal design that properly tolerates supply voltage and load variations. For that reason, a SPICE simulation was used to refine a design. The immediate application is for the PAROT chip driving a 40A SSR. I purchased a Yokoyama 5A Variac quite some years ago which was unsafe as purchased (with a current Test’nTag tag) and boxed up for repair / restoration. It is needed for a current project, so time to fix it! Above is the terminal block of the Variac. 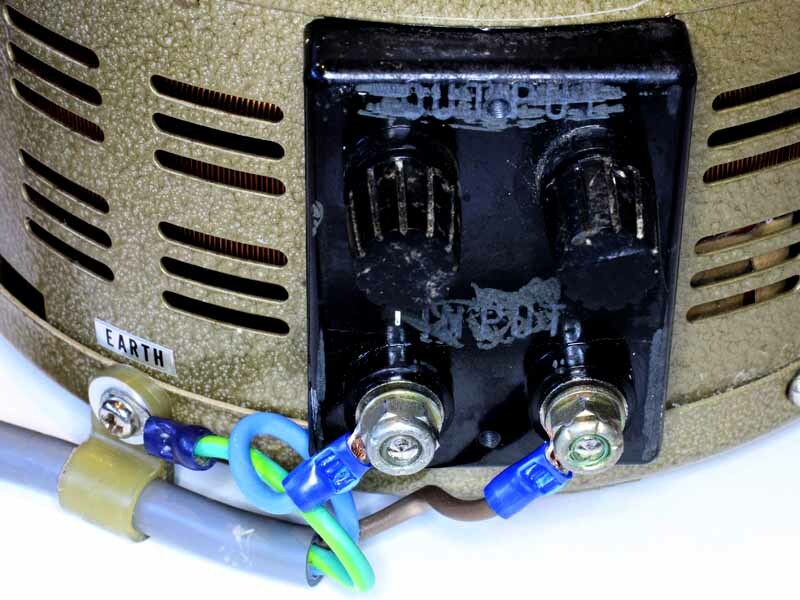 The defects include exposed input active and neutral terminals, exposed single insulated conductors, and the earth terminal has no spring washer or like and the screw also secures the resilent plastic P clip so it does not provide a reliable low resistance independent connection to the frame. There is no sign that there was ever a cover for this terminal block. It is noted that the terminal markings have been somewhat defaced. In a non-thinking moment, I had an accident with the mill because the head had not been clamped fully. 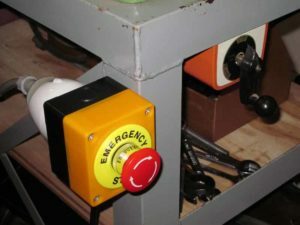 I found myself fumbling for the power switch and the incident reinforced the need to fit an emergency stop button. I had procured parts for this a long time ago, it was time to put them to use! 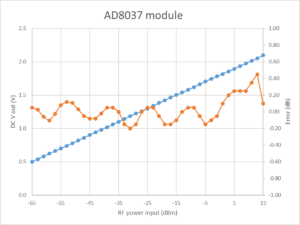 At Chinese AD8307 power measurement module #2 I concluded that the modified AD8307 was useful on HF, and through to 54MHz depending on accuracy requirements. 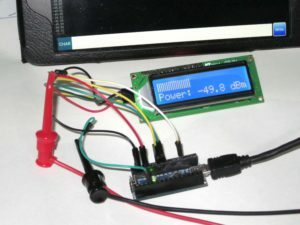 This article looks at combining the AD8307 module with a display option based on an Arduino Nano. 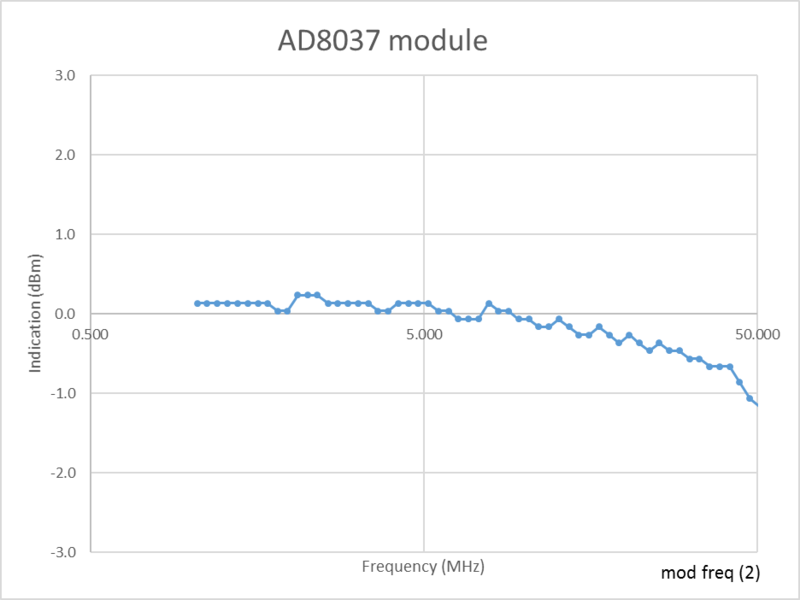 At Chinese AD8307 power measurement module #1 I documented the first phase of checkout of a low cost AD8307 module. gain from the SMA terminals to the AD8307 input terminals must be independent of frequency. 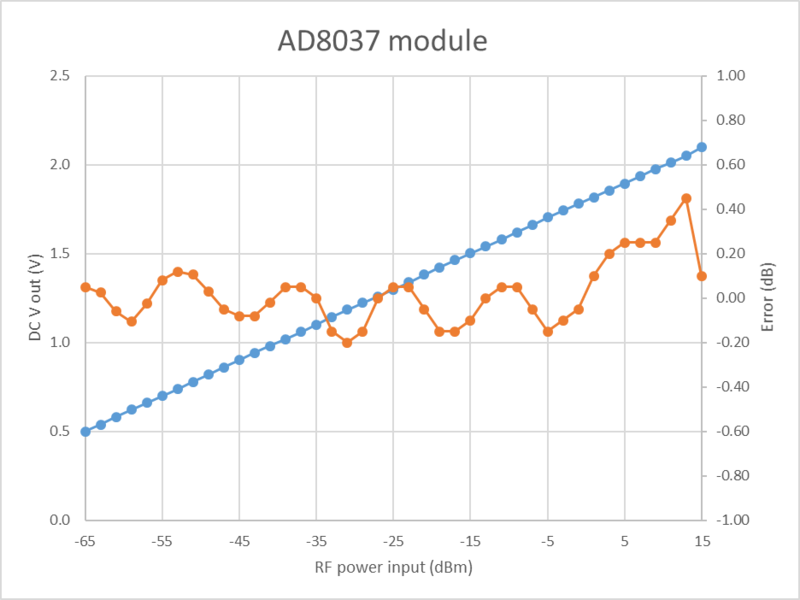 Though the module was clearly junk in terms of criteria 1 as supplied, it was possible to modify it to present a low VSWR 50Ω input impedance, and that was documented in the last chapter. This article carries on with criteria 2 above, the amplitude response. 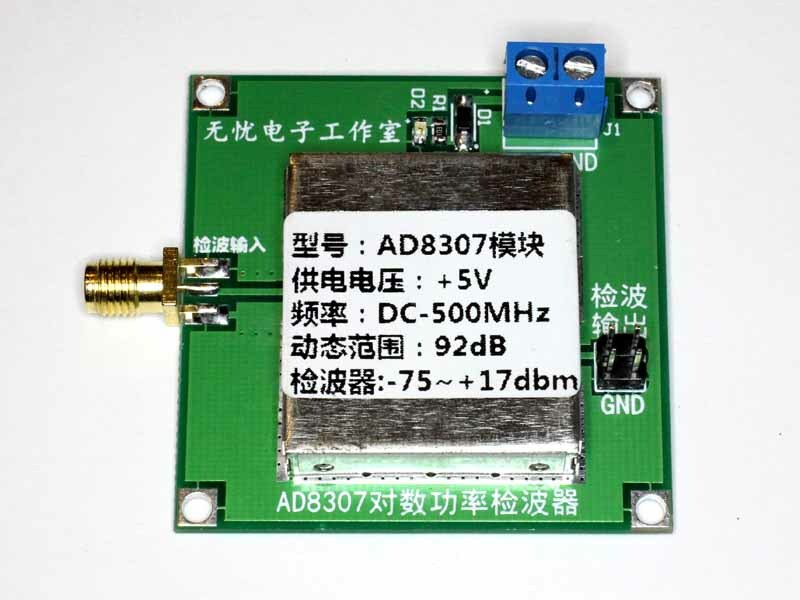 The application requires an adjustment of the AD8307 calibration to 20mV/dB with -90dBm intercept, meaning it will produce 1800mV at 0dBm input and have a slope of 20mV/dB. Though the original circuit shows the necessary components R3 & R4, and R5 & R6, they are not fitted and must be fitted to the board. I have used 50kΩ 20t trimpots for R3 and R6, and 33kΩ for R5 and 47kΩ for R4. The technique used to calibrate slope and offset is that described at (Duffy 2014). Above is a sweep from -65 to -6dBm after calibration of slope and offset. 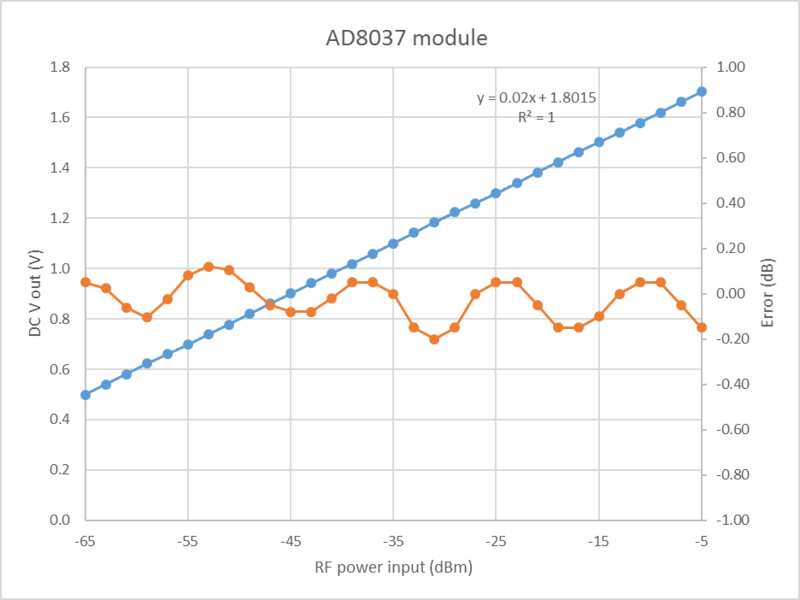 The linear fit to the blue curve shows slope is 20mV/dB and intercept 1.8015 for 0dBm means the offset is -1.8015/0.02=-90.08dBm. Log conformance is 0.2dB. 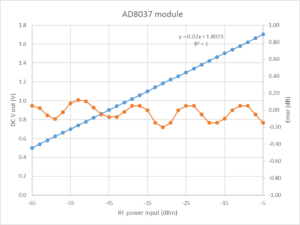 Above is the fuller plot from -65 to 15dBm, and it can be seen the linearity degrades above -5dBm, but the error is small for this class of measurement chip. The module was swept from 1 to 500MHz and response at 0dBm captured. Above is the response from 1 to 50MHz. Response is down by 1.5dB at 55MHz, but within 0.5dB to 30MHz so quite suited to the intended application, a HF common mode current meter. 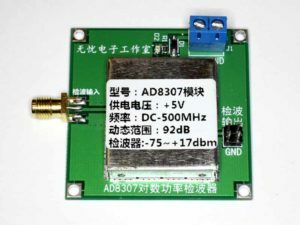 The module as supplied was cheap Chinese junk, it had 35dB slope from 10MHz to 1MHz, input VSWR from 1.6 to extreme over the range 1-500MHz. Reworking the input circuit delivered very good input VSWR to 240MHz. 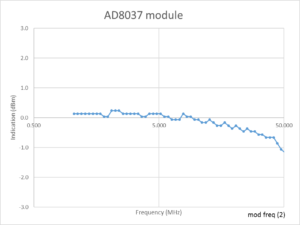 Amplitude response with the reworked input circuit is within 0.5dB from well below 1MHz to 30MHz. 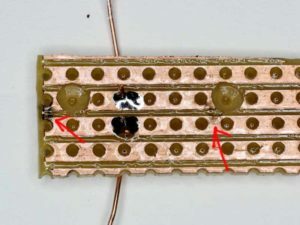 Flat response at VHF – UHF would require an equalised input circuit and appropriate PCB layout. I purchased a ‘ready to use’ AD8307 RF power measurement module on eBay for a project to develop a HF common mode current meter sensor for use with the RFPM1 (Duffy 2014). Price was A$22 incl post. 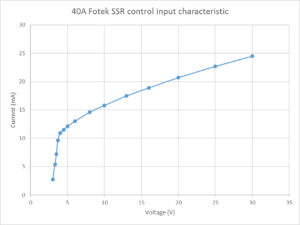 One of the measurement tasks that one often encounters is to measure the velocity factor of a transmission line. Often this is an indirect task of tuning a tuned line section, my method is to often measure some line off the role, find the velocity factor (vf), and use that to cut line for the tuned section making appropriate allowance for connectors etc. 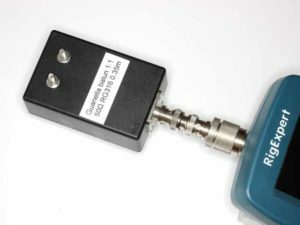 Measuring vf for an open wire line includes all that is done for measuring vf of coax, but requires measures to ensure that common mode current does not affect measurement significantly. form the line section being measured into a loose helix supported on some fishing line to spoil any common mode resonance.